Left: four cards showing how modern anglo-american playing cards evolved from late fifteenth century French cards. The so-called 'Suicide King' originally held an axe. Other examples of early Anglo-French cards also show details which appear in English cards. 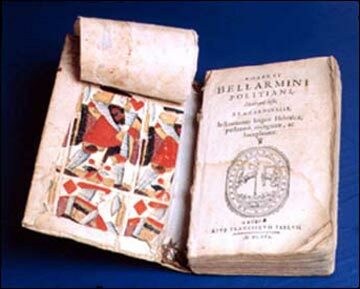 See also: cards discovered inside the covers of a book, from around 1450-75. After the development of the printing industry at the end of the 15th century, Rouen became an important centre for card-making whose influence extended far afield. The cards of Rouen are significant because many were produced for export to Britain and they became the model from which our English pack subsequently evolved. An archaic pack of cards made by Pierre Marechal c.1567 preserved in the museum at Rouen represents the model from which our English pack subsequently evolved. When England banned the importation of cards in 1628, English printers used Rouen court cards as inspiration for their own packs. 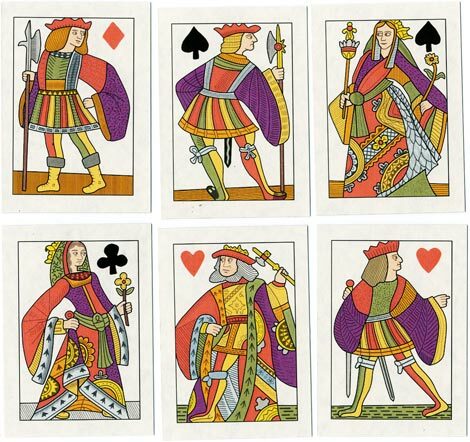 The style of the costumes on English playing cards is late medieval, being descended from the Rouen models. Above: facsimile based on playing cards by Pierre Marechal of Rouen, c.1567 which are the ancestors of the English pattern. The original Jacks of Hearts and Diamonds were missing but have been replaced with two similar cards also from Rouen. Published by Rose & Pentagram Design, 2006. www.historicgames.com. Images courtesy Rod Starling. 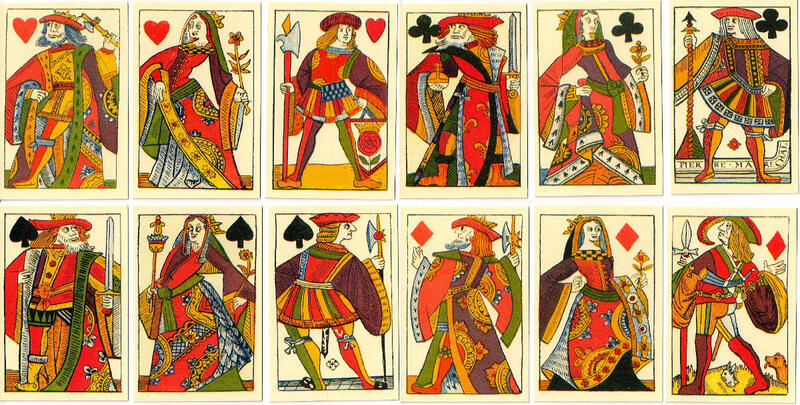 Right: a different facsimile with the Jacks of Hearts and Diamonds taken from different sources. Packs of playing cards reached England from Rouen.